If someone took the extended instrumental jam session that makes up the second half of the Rolling Stones’ “Can’t You Hear Me Knocking” and turned it into a band, what he would end up with would probably look and sound quite similar to the group Too Many Zooz. 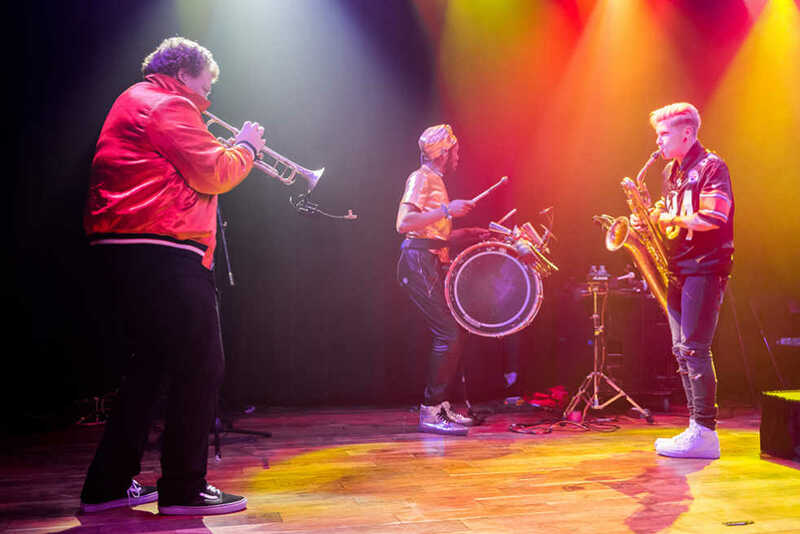 Too Many Zooz’s songs are mostly high-energy jams which fuse elements of jazz and hip-hop to form interesting rhythms and beats, much like the end of the aforementioned Stones song. The group’s tour in support of “Subway Gawdz” brought them to West Midtown’s Terminal West last Friday, where they played a show that was perhaps more exhausting than entertaining. Local electronic musician Double Nil opened for the Zooz, providing the audience members with fairly basic house music while they waited for the main act to arrive. Whereas Double Nil is an easy enough act to understand, Too Many Zooz defies classification entirely. The band combines traditional jazz arrangements and structures with the modern hip-hop beats that evolved directly from them, highlighting both the striking similarity and the stark differences between modern hip-hop and traditional jazz. Too Many Zooz is a truly unique band, making music that blends genres in a way that few others have attempted. The resulting music is interesting and fun. Their songs provide a fresh, energizing sound in a music scene that is saturated with artists simply trying to copy one another. All of this makes Too Many Zooz an entertaining band to listen to on a recording. The art of the performance, however, is a different beast from that of the album, and in this case the transition does not go smoothly. It is not that the group fails to deliver a performance as unique as their music. The concert, from its structure to its energy to its visuals, was entirely different from anything else out there today. Nor is it that the band does a poor job of replicating its sound in a live setting. The music is every bit as beautiful as it would be when streamed on Spotify. No, the problem with the performance is merely that the music of Too Many Zooz was never really meant to be listened to for more than about thirty minutes at a time. It is easy and enjoyable to listen to the band’s recorded music, which is divided into fairly normal-length songs that vary in sound and tempo, keeping the experience from feeling repetitive. In concert, however, Too Many Zooz did not divide its playing into clean, short tracks. In fact, it was pretty difficult to discern individual songs at all. After first coming onto stage, the band played continuously for roughly 30 minutes without so much as a pause. This first “song” consisted of one constant rhythm played on a saxophone, trumpet and drum set. Periodically, each instrument would break from the beat, going off on its own solo of sorts while the other two instruments continued to play the same rhythm. This performance was interesting for about five minutes, which is how long the song might have lasted had one been listening to it in recorded form. Soon enough, however, the repetitive jam lost its appeal and listening to the act turned into a chore. After this first musical marathon, the band reset, and it began all over again. After a few more repetitions, the concert was over. Certainly, in some ways these long, repetitive songs are characteristic of the jazz tradition in which they exist. Historically, jazz performances have featured long jams with repetitive rhythms. Still, few classic jazz musicians performed tracks longer than about fifteen minutes, and tracks that long typically featured lyrics that provided some variation and excitement for long-suffering listeners. However, the performance still had some redeeming qualities. The first of these is the fact that it would be easy to enjoy such a concert, if one went into the evening with the proper mindset. Too Many Zooz’ live music is less than ideal for passive listening, but it is excellent dance music. essentially just a glorified night at the club, then they would probably have a great time at a Too Many Zooz concert. Additionally, the group clearly cares deeply about giving its audiences a good performance. The artists played with a refreshing intensity, unlike many artists today who seem happy to simply stand on stage and play their studio music exactly as it appears on their albums. Clearly, Too Many Zooz needs to make some serious tweaks to the style and structure of their performance if they want to maintain a following and exceed their status as studio musicians. Still, the energy the group brings to its performances is promising. If it can outgrow its obsession with length, Too Many Zooz may well find success on the horizon. The group is on tour in the U.S., Canada and Europe, with the closest upcoming appearance at the Okeechobee Music and Arts Festival in Florida.